Athens, 7 June 2018. The global shipping industry’s interest is attracted by the presence of the Hellenic Centre for Marine Research (HCMR) in Posidonia 2018, the world’s most prestigious international shipping exhibition, which takes place from June 4 to June 8 in the Athens Metropolitan Expo centre. 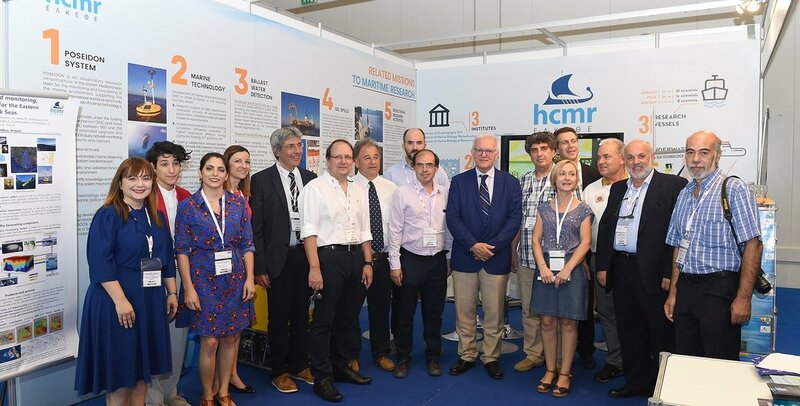 This first participation of HCMR in the world’s top shipping event emphasizes the contribution of the Center’s multilevel scientific and operational work to the maritime sector in Greece and the wider Mediterranean region, which has a long and historic shipping tradition. Integrating HCMR’s vision to assist the development and further advancement of blue energy sector in the Greek market , transfer knowledge & know-how to the stakeholders and raise environmental awareness on Blue Energy issues, this Program focuses in research projects on MRE assessment and fostering collaborations between business sector, research & technology organizations, public authorities and civil society by coordinating the first Greek HUB for Blue Energy (via PELAGOS project) aiming at cross-cutting innovation and solutions tailored to the needs of the Mediterranean Sea. Over the past twenty years HCMR has carried out a series of monitoring surveys in the Hellenic Seas in order to study the possible environmental impacts of maritime accidents on the marine ecosystem. The existence of HCMR long time series of background data on the ecological and pollution status of the Hellenic Seas assures the reliable investigation of the environmental consequences of maritime accidents on the marine ecosystem health. The Ballast Water Detecting Lab in HCMR is the first Greek reference ballast water sampling and testing laboratory that will detect and count viable plankton cells within certain size ranges according to the Ballast Water Performance Standard IMO D2-Regulations set by the International Marine Organization (IMO). The laboratory will support sampling in Greek commercial ports, ballast water compliance testing under the D2 regulation of BWM Convention, preparation and reviews of risk assessment studies for BWM exemptions under the A4 regulation of the ΒWMC and training of crew and officers in ballast water sampling and in situ non-indicative analyses. POSEIDON (www.poseidon.hcmr.gr) is an observatory research infrastructure of the Eastern Mediterranean basin, for the monitoring and forecasting of the marine environment, supporting the efforts of the international and local community and replying to the needs and gaps of science, technology and society. The system is being developed in accordance to the policy frameworks suggested by IOC/GOOS, EuroGOOS, MonGOOS and GEO while it maintains a balance between the operational and research character of the infrastructure through the integration of methodologies and tools developed in relevant EU initiatives and projects. CLAIM project explores ways to prevent micro and macro-litter entering our seas using innovative, low cost (energy and cost) methods, such as a nanomaterial-coated filter device that harness the Sun’s radiation and accelerate micro-plastic degradation and a thermal treatment device (pyroliser) for transforming macroplastics into a combustible reusable gas, syngas, able to be installed on vessels, ports, and wastewater treatment plants. CLAIM (www.CLAIM-H2020project.eu) is funded under Horizon2020. The consortium consists of 19 partners, 5 of which are small and medium-sized enterprises. The above 6 axes were presented to media representatives by the President of the Board and Director of HCMR, Prof. Spyridon A. Mavrakos, during a workshop at the Posidonia exhibition. Prof. Mavrakos stated: “I am really happy and proud for HCMR’s participation in Posidonia 2018, a real celebration of the global shipping industry. And I’m particularly happy because here we have the opportunity to present to a vibrant and dynamic community our important scientific work, which supports the maritime sector in Greece as well as in the Eastern Mediterranean. With respect to the environment and the human element, we develop and deploy research tools that actively support the sustainability of the shipping industry”. The Hellenic Centre for Marine Research (HCMR) is a governmental research organization, supervised by the General Secretariat of Research and Technology of the Ministry of Education, Research and Religious Affairs. The Center operates 3 Institutes and 2 Aquariums (Cretaquarium Thalassokosmos, Rhodes Aquarium), while it owns and operates 3 oceanographic vessels, 1 deep-submergence vehicle and 4 remote vehicles that support the work of all research sectors of the Centre, both in national and international projects.